My daughter Ali is an enthusiastic, aproned artist in the kitchen, and is all about putting love on the table. She called the other day to say that while at play she’d created a salad she thought I’d like. I’ve been impatiently waiting for my appetite to return because (even while sick) the sounds of this salad set off sweet harmonies and the songs of birds in my head! : ) Last night I was finally able to make it, and once again, the birds did sing! Quick & Easy – Preheat oven to 350°F. Place breasts on rimmed cookie sheet lined with foil or parchment paper for easy cleanup. Brush both sides of chicken with olive oil and generously sprinkle with coarse salt and a little pepper. Roast for 35-40 minutes (depending on size and thickness, or until chicken registers 160°F on and instant-read thermometer.) Allow chicken to cool to room temperature. Just before combining with other ingredients, slice diagonally across the grain in 1/2-inch slices. Slow & Scrumptious – Marinating the chicken before cooking using the following marinade (good also for shrimp or any white fish) and then preparing in the oven or on the grill will add more juicy flavor to your chicken. In a medium bowl combine all ingredients except the oil. Using a whisk, gradually add the oil in a thin, steady stream until creamy. 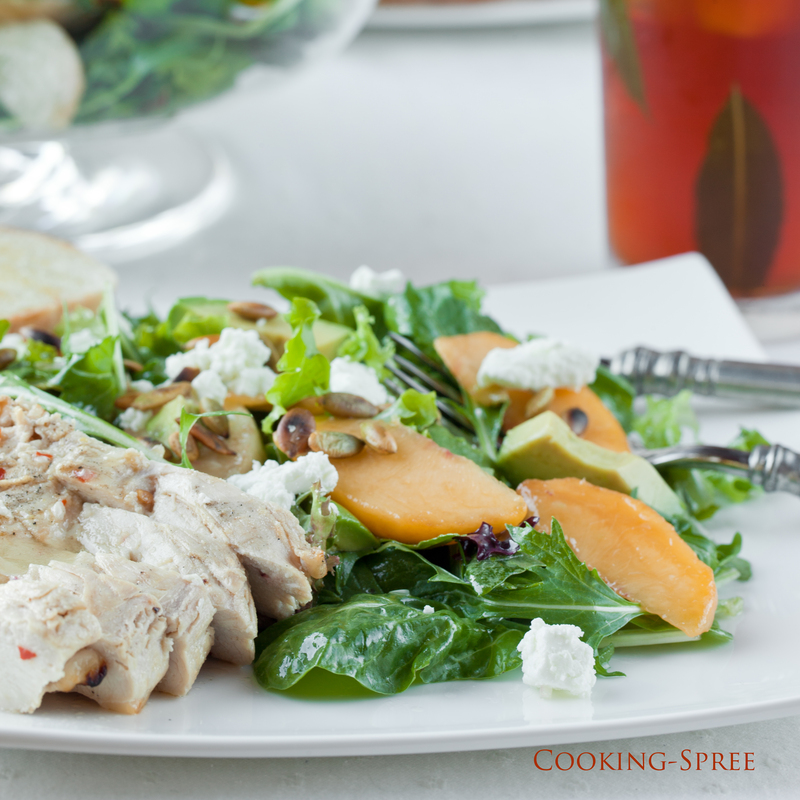 To assemble the salad, combine the greens, (and lemon verbena if using), peaches, avocado and chicken in a large bowl. Add enough dressing to lightly coat the salad. Crumble goat cheese over all and scatter with toasted pepitas (if using.) Place additional dressing in a small pitcher at the table. How about blueberries, or plums, or apricots, or raspberries? Or various combinations? How about a piece of grilled white fish in place of the chicken? Or fresh-steamed crab legs? Doesn’t it set your wheels to turning? I love that about a good salad! A note on the Lemon Verbena. I had planted it in my herb garden for the first time this year. I knew I’d use it in iced-tea and I had some sweet things in mind for it – ice-cream being one. Cutting some for my tea last night, I thought I’d try a little in the salad. It added a lovely lemony fragrance, without the tart, and a hint of herbal/lemony flavor. 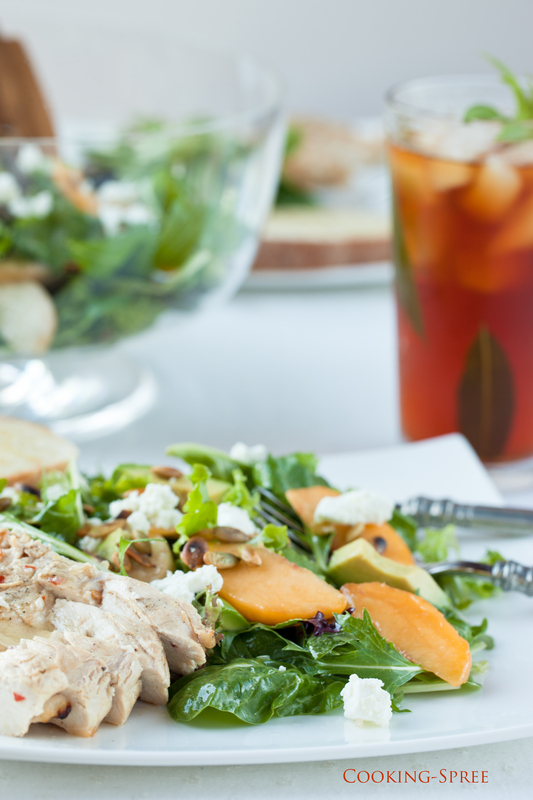 I’d do it again – but this salad is delicious, refreshing, and healthy just as it is. Thank you dear girl for the wonderful contribution! Thanks for sharing this recipe. It really is so good. Would love to know what other creative changes people find work with the salad. It certainly provides a springboard. We’ve been using this recipe for the champagne vinaigrette for years from a Nordstrom cookbook. Last I checked, they sold this dressing in the bottle at their cafes, though it never seems to taste as good as when we mix it up ourselves. It really is the quintessential summer dressing. Trader Joes Vanilla Blueberry Goat Cheese and dried blueberries is another excellent twist. Salad for dessert anyone?! The kids adore this salad and so does their mother! Nummy Ali. Loved the roasted pumpkin seeds (pepitas) crown!